“Then I’m not sure what the ‘D’ gets me,” she joked, smiling and obviously in a very good mood. Celebrities are especially giddy about arriving in such an idyllic hideaway because the slender island does not cater to peering paparazzi. Hollywood royalty such as Academy Award-winning actors Catherine Zeta-Jones and her husband Michael Douglas have resided in Bermuda, along with New York’s City’s billionaire mayor Michael Bloomberg, who travels less than two hours by air from the Big Apple. 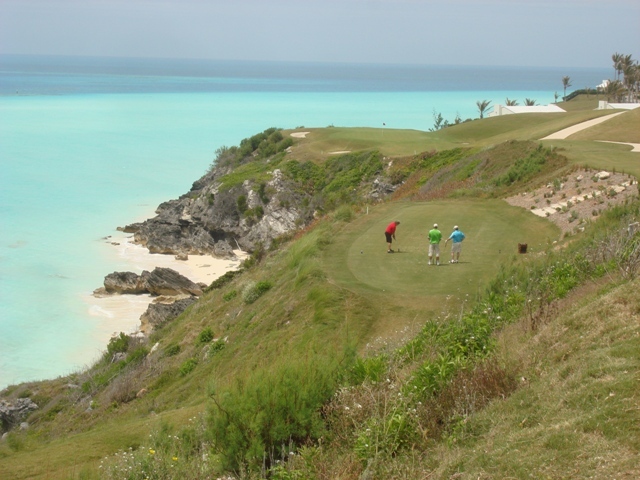 For the next two years, as they have for the past four years, professional golf’s 2011 major championship winners (in the past the likes of Ernie Els, Graeme McDowell, Jim Furyk, Padraig Harrington, and Angel Cabrera) will come to Bermuda to compete in the PGA Grand Slam Tournament at the ocean side Port Royal Golf Course. It’s not the stars people come home raving about, though. It’s the pure pink sandy beaches and neon blue water so brilliant it is hypnotic.